From Georgia we made a short 48 hour stop in London, partly to visit an old friend and partly to go see The Killers at Wembley (coincidentally absolutely amazing!). My mate Coll organised it and had said prefaced it with that it would be the most amazing weekend of our lives, a huge call but it certainly lived up to it. On this short stay the beer was never going to be amazing, although it would inevitably be plentiful. We'd left Tbilisi airport at 4:30am and by 12 (admittedly with a time difference) I was already on my third beer. The beers we were drinking at first were by no stretch of the imagination English. They were cans of Kronenbourg 1664. When you are staying with a poor student you can't ask for quality... At £1 for 500ml I couldn't see a reason to say no, and I was pleasantly surprised. The beer was drinkable ice cold and got better the more you had. My one aim in London was to have a beer on cask. After a few warm up cans of Kronenbourg we headed to The Elgin to achieve my aim. At the pub I had not only my first but also my second ever cask beer. The honour of first fell to Young's Special Premium Ale as the girl changed the cask of my first choice, Adnams Ghost Ship Pale Ale. 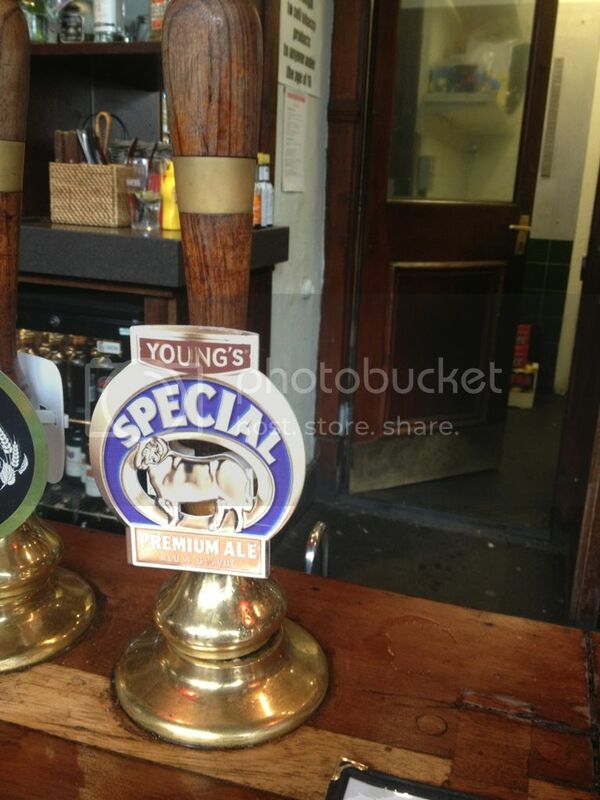 The Young's was a solid English Ale. Quite drinkable but relatively light on flavour. As for the Adnams it was a sensational beer. Termed an English Pale, more by geographical location than anything else I could see, it was well balanced with sour malts and bitter citrus hops. From the pub we headed back via Sainsbury's to pickup some more quality lagers (Kronenbourg and Carlsberg) before heading to Wembley. I couldn't bring myself to pay £5 for a pint of Carlsberg there so hung out for the beers back at home. After the concert we reminisced about the old times when our friend lived in Melbourne over a few (many) Kronenbourg's. By 3am we'd caught up and it was as if he'd never left. I don't think I've ever drunk as much Kronenbourg as I did that night and I don't think I ever will again. But it's a beer that will now hold good memories. I also leave London with having ticked off something from my bucket list, having a beer on cask. All in all a successful trip to London, bring on Vilnius in Lithuania!